On the same day there was another classmate who got married. 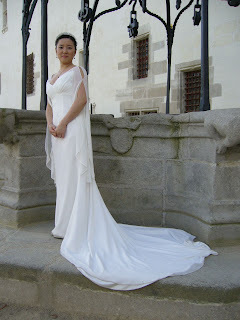 My friend went and took some photos, and I found her gown so excellent and original. 100% agreed. I used to not like the French style gown (despite the fact that Paris is the city of fashion), but I gradually discovered the nice one. Do you wear your wedding ring? You want a big "bite" or a medium "bite"? My neighbore can be...a Malaysian? I locked myself in the garbage room!